The regular admission fee for the Guggenheim Museum is $25 for adults and $18 for Seniors (65+) and Students (with valid ID). Children under the age of 12 are admitted free. On Saturdays, from 5:45 p.m. to 7:45 p.m., visitors can pay what they wish for admission. The suggested donation is $10, but you can pay less. The last tickets for entry are issued at 7:15. The museum closes at 7:45 p.m.
See visitor reviews of the Guggenheim Museum at TripAdvisor. 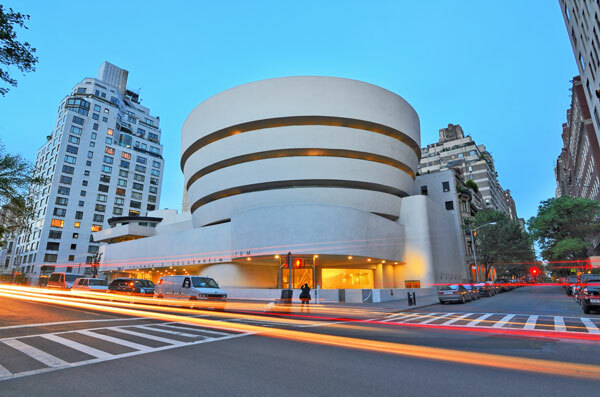 You can download the free Guggenheim app for your iPhone or Android phone prior to your visit. The app displays information based on where you are in the museum. The Guggenheim provides a free wifi network for guests. If you plan on using the app, don’t forget to bring your earphones so you can enjoy the audio portions of the guide. The Guggenheim address is 1071 5th Avenue. It’s located adjacent to Central Park, at 5th Avenue, between 88th and 89th Streets. It’s five blocks north of the Metropolitan Museum of Art. See a map.